Central Sleep Apnea is a situation in which breathing stops for a few seconds during sleep. The body simply "forgets" to breath. Central sleep apneais caused by dysfunction in the part of the brain that controls breathing, (brain stem). In general, the brain stem is very sensitive to changes in the blood level of carbon dioxide. The brain stem signals the respiratory muscles to breathe harder and faster to remove carbon dioxide through exhalation, and vice versa, when the level is high. The brain stem is less sensitive to changes in the carbon dioxide level, in case of central sleep apnea. The body's response is inflated, resulting in extended hyperventilation because the brain stem responds slowly to the buildup of carbon dioxide in the blood. Similarly, the body's response - a pause in breathing - is extended because the brain stem responds slowly to the removal of carbon dioxide from the blood. Brain stem dysfunction that leads to central sleep apnea may be due to brain tumors. People who have heart failure may have central sleep apnea. Congestive heart failure is a major risk factor in both obstructive and central sleep apnea. High blood pressure is common in both types of sleep apnea. Sudden drops in blood oxygen levels that occur during sleep apnea increase blood pressure and strain the cardiovascular system, increasing the risk of heart failure and stroke. If there is underlying heart disease, these repeated multiple events of low blood oxygen could lead to sudden death from a cardiac event. During an occasion, a person may stop to breath for an unusually long time, then suddenly inhale rapidly, and also, the person may inhale at regular intervals, but exhaling becomes difficult, again, due to some neurological failure, such as muscles relaxing at that moment, when they should be open. In some people, recurrent central sleep apneas during sleep are not associated with any clinical manifestation or physiologic disturbances. In others, they present with symptoms of daytime sleepiness, morning tiredness, recurrent nocturnal awakenings and morning headache. 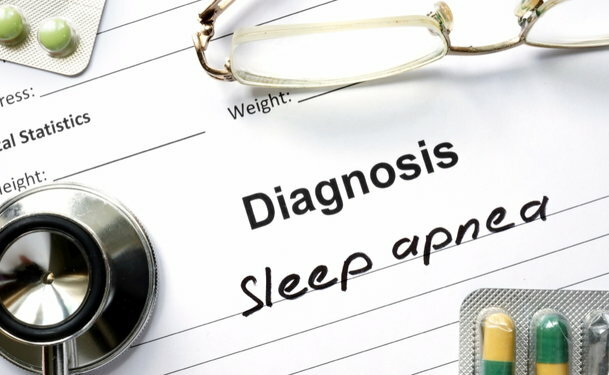 Snoring does not generally occur in central sleep apnea. However, breathing patterns may be abnormal. Cheyne-Stokes respiration (periodic breathing) is an example. In Cheyne-Stokes respiration, breathing slowly becomes more rapid, gradually slows down, stops for a short period, and then starts again. Then the cycle repeats. Each cycle lasts 30 seconds to 2 minutes. Central sleep apnea is rare in people who are not seriously ill. Patients with a mixture of severe and life-threatening lower brain stem lesions show central sleep apnea. Breathing is controlled by the brainstem. As a result, any disease or wound affecting this area may outcome in problems with normal breathing during sleep or when awake. Bulbar poliomyelitis, neurodegenerative illnesses, encephalitis affecting the brainstem, and stroke affecting the brainstem, are the conditions that can cause central sleep apnea. Other causes of central sleep apnea include complications of surgery of the secondary radiation in the region of the cervical spine, cervical spine, severe arthritic and degenerative changes in the cervical spine and/or base of skull, or primary hypoventilation syndrome. The diagnosis of Cheyne-Stokes respiration requires an overnight polysomnography performed in a sleep laboratory. Screening tools for Cheyne-Stokes respiration are under development. Optimizing the treatment for congestive heart failure is the first step of central sleep apnea treatment. The addition of angiotensin converting enzyme inhibitors, digoxin or increasing the diuretics is among the potential therapeutic interventions. Among those with persistent Cheyne-Stokes respiration, various forms of continuous positive airways pressure (CPAP) have been advocated for central sleep apnea treatment. The use of CPAP has been shown to improve cardiac function, quality of life and lessen the need for transplantation.